You come out ahead when you buy refurbished office furniture. While you may be looking with envy at the new furniture, wondering if you should reconsider your decision, stick to your first plan. When you choose refurbished furniture for your office, the environment also wins. Instead of throwing two sets of office furniture (yours and the refurbished furniture you’re buying) into the landfill, you’re diverting it and, using recycled materials, you are making pre-owned office furniture look just like new. Office refurbishing experts closely inspect furniture that’s about to be refurbished. They repair every flaw, scratch, ding and broken area, making the furniture look like new. Bent sliding tracks will be replaced, enabling file drawers and desk drawers to close more easily; scratches in wood will be removed and varnished over; seat materials for office chairs will be replaced, making an older chair much more comfortable to use. Not only will it be of high quality, if you have the chance to choose fabrics or leather for chairs or other pieces, you may also be able to pick those that fit in with your color scheme or branding plan. You probably lost your breath when you looked at the prices of new office furniture. When you multiplied those numbers by the quantities you need, that’s the time when you decided to choose refurbished office furniture. Percentage-wise, you can save between 30 and 50 percent of the list price of new furniture. Dollar-wise, anticipate saving between .75 to .85 cents on the dollar for every item you need. That’s not bad, is it? Once you figure out the math, you’ll see just how much money you’ll be able to leave in your company’s account. “Sure, I’ll save money. But, won’t that refurbished furniture show its age?” Not really. While a refurbishing expert looks for every flaw, they may not catch every one. What’s a ding or two that can be hidden by a piece of office equipment? When you buy new office furniture, its resale value falls to 25 percent, at most, of its original price. That figure goes into your books and you have to account for it at tax time. Buying refurbished furniture enables you to benefit from increased value; also, if you decide to sell that furniture later on, you may be able to price it for as much as 75 percent of what you paid for it. That’s a win-win! If you have any questions discuss these issues with one of our Cubiture furniture experts. When you think of how full our landfills are, you may hesitate to throw an office full of used, but still useful, furniture there. When office furniture is well cared for, it can last longer than 20 years. So, why not send your own furniture to be refurbished and buy refurbished furniture to replace it? Long-term, these actions help to save our finite natural resources and protect our atmosphere. Browse our office furniture and choose refurbished. 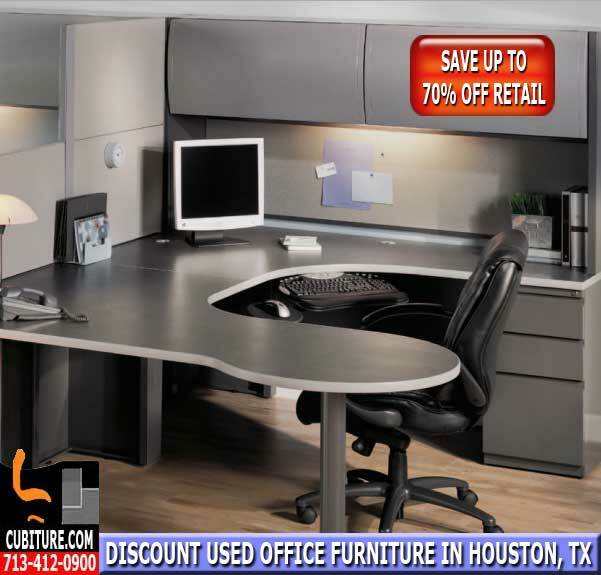 Call Us For A FREE Refurbished Office Furniture Quote 713-412-0900. Visit Our Office Furniture Showroom Located On Beltway-8 between West Little York & Tanner Rd. On The West Side Of Beltway-8 In Houston, Texas.